We truly believe that by investing in the best technology, we can provide the best care to our patients. In fact, Dr. Willis speaks about this topic across the nation to encourage other dentists to adopt technology into their practices in order to provide an unmatched service to their patients. Advanced technology means you can save time, money, and have less invasive and more comfortable experiences, every time. Check out below to see what technology we offer to better serve you! Our main job is to keep you healthy. That’s why we offer oral cancer screenings to keep an eye out for any disease and catch it early. 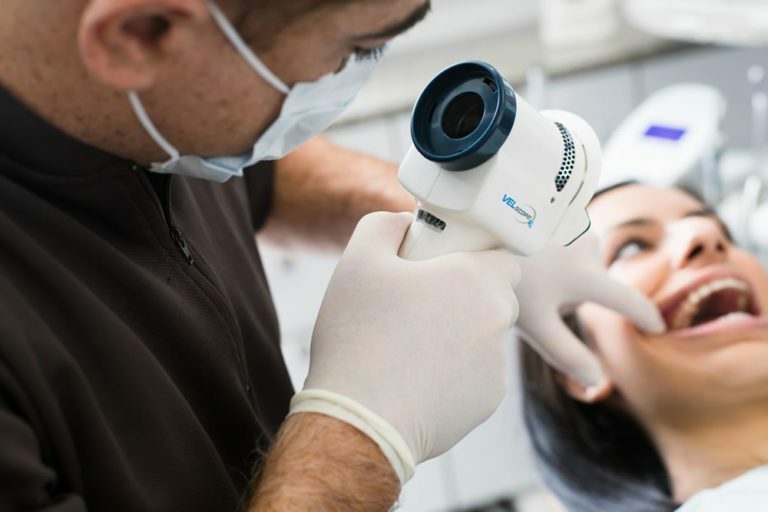 We complete oral cancer screenings during our hygiene health and wellness appointments, often using a completely painless tool called the VelScope. This screening device puts out a special light that helps us identify areas of concern much earlier than we can see with our naked eye, and early detection is critical in diagnosing and treating oral cancer. 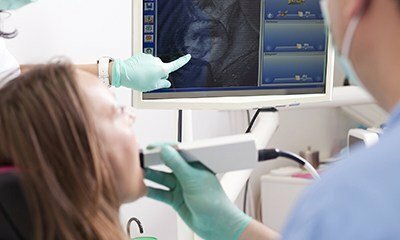 Instead of looking at old film x-rays and only seeing inside your mouth from a one-dimensional angle, 3D scans allow us to see much more! With digital x-rays we can quickly see in and around your teeth and catch decay much earlier on which can save you money by preventing the need for more expensive procedures or surgeries. And with 3D technology, we can safely plan dental implants, and even help analyze your airway if you are struggling with sleep apnea to see what your treatment options may be. We create our own crowns in-office that are customized and measured to your mouth. 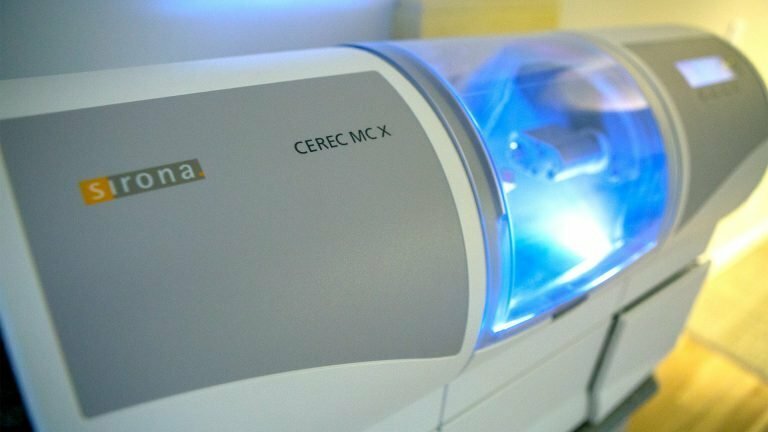 The CEREC technology allows us to create and deliver your crown in just one visit! Plus, you don’t have to sit through any of those goopy impressions to have them done. There are no temporaries to worry about falling off at home. And because it’s done in one visit, you only have to be numbed up one time. An intraoral camera gives the patient a view of what the dentist sees. It’s about the size of toothbrush with a camera on the end allowing us to show you broken fillings, fractured teeth, decay, or any dental problem. That way you can see for yourself, and we can discuss the treatment needed together and decide what treatment is best for you. Our CEREC 3D scanners have been allowing us to make same day crowns for over 20 years. But now, we can use that same digital impression system to gather the information we need to deliver Invisalign® Orthodontic treatment without the need for those goopy impressions. 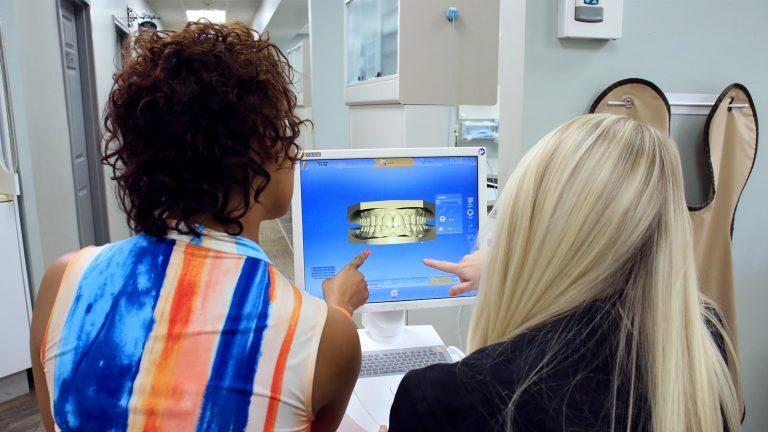 Plus, these digital impressions are typically more accurate, more comfortable, and allow you to get your case started much faster. Most patients are not a fan of “the shot” when it comes to having dental treatment. That’s why Dr. Willis has been using a computerized technique for numbing patients for over 20 years. 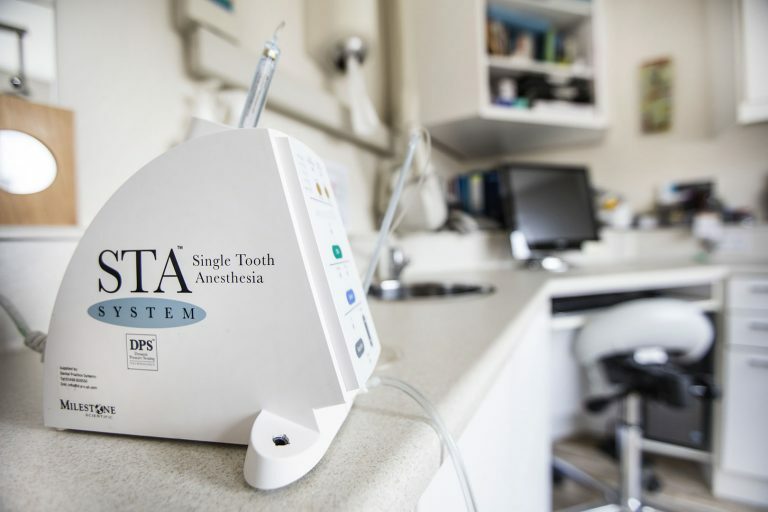 The WAND, is a computer assisted local anesthesia system that carefully guides dentists as they are performing dental injections, making the experience much more comfortable. To make you feel right at home, each of our treatment rooms include televisions, some even mounted on the ceilings! That way, you can watch your favorite shows, listen to music and even enjoy our in-house WiFi to help the time pass.